Kicking off the 2017 season, Bellator 170 comes to you live from the Great Western Forum in Inglewood, California, January 21. Packed with all the ingredients for a memorable night, the main event features the highly anticipated confrontation between Chael Sonnen and Tito Ortiz. The undercard bouts are not be ignored, as there is a line-up of rising talent looking to make a name for themselves and steal the show. Fighting out of Gooch Training Academy/Saekson Muay Thai, Rob Gooch will be making his Bellator debut. Gooch has had a long journey arriving to this historic moment in his fight career. It’s hard to believe eight years ago this ambitious fighter was just a juvenile delinquent heading nowhere. His entry into Mixed Martial Arts would be the lifesaver which gave Gooch a positive outlet for expressing himself and driven purpose for living. 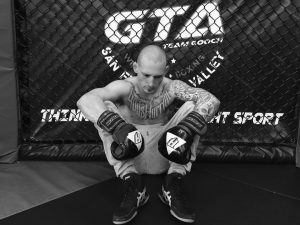 After competing in his first amateur fight in 2010, Gooch knew this sport was his life. Later transitioning into the pro division he would accumulate a record of 5-3 battling it out with other up and comers and MMA veterans. His will to face obstacles has put him in a class by himself. This combined with his endless hard work ethic earned him his spot to compete in the Bellator Fight Championship. Gooch is excited and grateful for the opportunity to showcase his talent on a premiere fight stage. Seizing that moment will be no easy task. In his debut at Bellator 170, Gooch will square off against (6-2) James Barnes. Coming off a tough loss to Cleber Luciano at “Gladiator Challenge: Rampage”, Barnes has every intention of getting back in the winner’s bracket with a victory over Gooch. However, Gooch doesn’t plan on going down without a fight. The preparation for the upcoming fight was done at Rob’s very own gym “Gooch Training Academy”. Opening in 2013, having his own gym has allowed Gooch to be financially secure while living life through his passion for fighting. In addition from aspiring champions to bully prevention, Gooch Training Academy has served as a hub to assisting all clients with their aimed goals producing satisfying results. “Though it has been a never ending grind, it’s the best thing in the world owning my own gym,” he said. “I get to share with the world my passion and my talents! Working with my kids program has kept me motivated on a daily. Seeing a shy or bullied kid grow into a confident outgoing kid is indescribable. 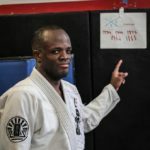 I created world champions in Jiu Jitsu in both my kids and adult programs, people who never thought they would even compete, yet alone competing in the biggest Jiu Jitsu platform. There isn’t a price you can pay me that would make me feel better than when someone says “Thank You for changing my life”. All of the undying support at his gym and self-confidence is great motivation heading into Bellator 170. Gooch is aware of the tough mountain he has to climb to become the best in the world. A victory over Barnes will serve as the kick start which hopes to be a successful run in the Bellator bantamweight division. 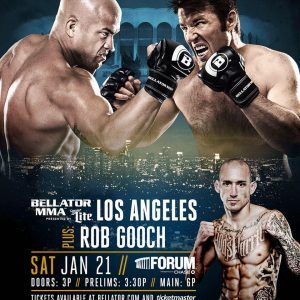 Tune in January 21st to watch Rob Gooch in action at Bellator 170!